CM Magazine:Reena: A Father's Story. Surrey, BC: Heritage House, 2008. Parents of murder victims-British Columbia-Biography. Our doorbell rang non-stop, the phone kept ringing, and people and cars thronged the street. Television news reporters with vans, satellite dishes and cameras surrounded the house. I was in a daze; I had never experienced such an onslaught. Our photos were pasted on all sorts of newspapers. It felt as if our two-story home was part of a war zone, with burning missiles coming from all directions late at night and early in the morning. I was devastated, constantly crying, and just wanted to be alone, but the media did not give us any privacy to grieve the death of our daughter. Morning to night, we received calls from all over Canada, the United States and countries abroad: Reena's death had made international headlines. Reena: A Father's Story is the tragic story of Reena Virk, a 14-year-old girl, brutally murdered by fellow students in Victoria in 1997. In addition to telling the story of Reena's brief life and the trials of her killer, Reena tells her father's story. We learn of his early life in India, the move to Canada, his marriage and the raising of three children and his employment history. We also learn of the poor relationship Manjit had with a daughter he deeply loved but didn't understand. For some reason, unknown to her father, Reena rejected her family, and this decision led to her death. Had she accepted her father's wise counsel, she would likely still be alive. Author Manjit Virk has an MA in English. His writing style is uncomplicated and suitable for the intended readership. He also writes with a passion that only someone who has suffered a great loss can appreciate. His grief is palpable, and, as a result, Reena is a heart-wrenching story. Reena could be called Manjit's Story for there is much more in the book about him than his daughter. Her death is the focal point of Reena, but we also learn a great deal about Indian society and her father's outlook on life. In addition, Virk writes a scathing account of his treatment at the hands of the B.C. Ministry of Children and Families and the news media. He is also very critical, justifiably so in light of what happened to the primary killer of his daughter, of the B.C. justice system. After reading his book, few will disagree with his charge that "there were no winners except for defence lawyers; we were all losers, including the taxpayer." Reena has a timeline of events in the Reena Virk story. It also has a family tree starting with Reena's grandparents. It is illustrated throughout with functional black and white family photos from happier times. 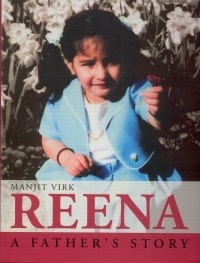 There are coloured photos of Reena and Reena and her family on the book's cover. Reena could be used as classroom support if the class is dealing with issues such as immigration, racism, justice, and adolescence.